Online poker is growing more and more every day as time goes by. With this comes many beginners and different styles of poker players. There are so many poker players that are just simply bad at online poker. They don’t know the game, and they are really just giving money away. Some think that after watching a poker tournament on ESPN that they are ready to buy-in at a $500 no limit cash game. This is great for you and not so good for them. The thing about it is that they will keep on coming back to the tables to give up even more money. There are two things that you will need to do in order to take advantage of bad online poker players. The first thing is to actually search for bad online player and the other thing is to gather them up as you are playing. You should be collecting a huge list of bad online players as you play and taking advantage of them every chance that you get. For the most part, the only way you can really find bad players is by playing. At first you will not know where to look, but it will not take long to find them. You will probably find bad online poker players in every game you play in. When you do find one, write down the name or add to your buddy list if your room offers that feature. If you do that every time you find a bad player you will have your own list of terrible poker players. There are players all over the internet that are just out there donating money. There is no reason that you cannot and should not be one of the players that are getting a piece of the donation pie. In fact, if you do it correctly you can make them your personal ATM for as long as they choose to play on that site. Once you have your list, you are ready to start taking advantage of these players. Every time you play you are going to search for these players that are donating money. That way when you sit down you will already be playing with at least one player that you know is not good. From there, you will know how to take advantage of that situation. If you can manage to find a couple of players from your list at the same table, that is even better. This is just one small thing you can do to increase your online poker profits significantly. You should look for those maniacal poker players who really just do not care. They will donate all night long, and you will also know how they play. Instantly, you already have a huge advantage than anyone else at the table without doing anything immoral or wrong. This will have the best effect if you play in cash games. It also works pretty good playing at sit n goes as well. 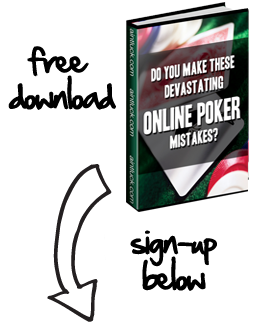 Before you know it you will have a list of 100 or more terrible online poker players. That makes poker life much easier.